Since most of your pictures will be shot at night, it’s important to remember a few basic bachelorette party rules. When taking pictures of bachelorette party decorations, be sure to hold the camera very steady or use a tripod to avoid any movement. Take them prior to the last night out festivities so you are not too buzzed. For most pictures that are indoors or at evening bachelorette parties, you will want to turn on the flash on your camera. For bachelorette parties during the day that are outside, you will want to turn off the flash as they only light things up a short distance from the camera, usually five to ten feet. Use a high speed film such as ASA 400 or if using a digital camera, set the ISO to 200 or 400. 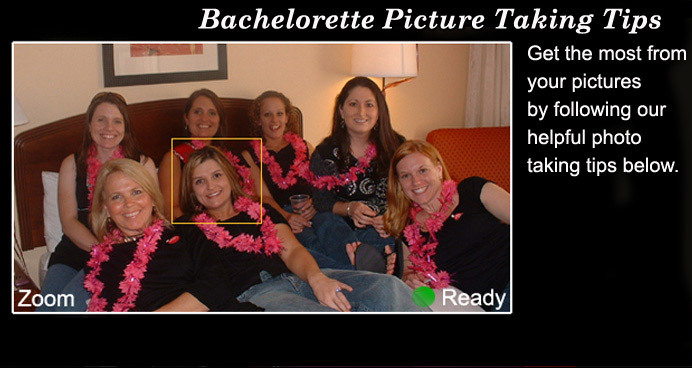 Try to experiment before the bachelorette party to figure out the best setting for your particular camera. If you are having co-ed bachelorette and bachelor parties, make sure to still get pictures of the girls all together without the guys and then some group shots. Also take some of the bride-to-be partying with her divas as well as the groom and his buddies. Get a mixture so it does feel like two parties as well as one large last night out. Make sure the bachelorette party camera is not too close to the water unless it is water proof. Make sure someone is responsible for the camera as many bachelorette party photos never make it since the camera is lost or stolen. Take some great group photos of all the bachelorettes in the water. Don’t take bachelorettes in their bathing suits if they are sensitive to their body or do not like to be in photos. This is why group shots in water work so these bachelorettes can have their bodies submerged. Don’t take any revealing photos that will embarrass someone or may be seen by the groom-to-be and his friends. Place disposable bachelorette party cameras, along with a note inviting any and everyone to take photos. At the end of the bachelorette party, have a responsible bridesmaid collect all the used cameras. Have a maid of honor or bridesmaid develop the film and put the photos together in an album for the bride-to-be. It is fun to see the last night out from so many different perspectives and it captures many moments that would have been missed had you only appointed one bachelorette to take photos! Place together a scrapbook containing photos of the bachelorette party. Have everyone from the last night out write on bachelorette party napkins some marriage advice. Have a creative maid of honor or bridesmaid take the bachelorette party last night out pictures as well as the napkins with advice and arrange them in a photo album as a gift for the bride-to-be. A great wedding gift idea for a young couple just starting out with a small budget and don't have these things on their shopping list as necessities is to purchase a nice digital camera for the couple and use it at the bachelorette and bachelor party. Have everyone chip in for this gift that you can get for a reasonable amount at a Wal-Mart, Costco, or Target. This is a great bachelorette party gift that you can use to take pictures from at the bachelorette party and then present the camera to the bride-to-be at the end of the party or bridal shower! You can also set up an online photo site for her to download all the pictures like snapfish.com. One of the saddest things are bachelorette party pictures that stay on a camera and are never downloaded or developed, possibly even being erased. Have a responsible bachelorette or maid of honor take care of getting the pictures downloaded or developed within 2 days of the bachelorette party so the bride-to-be can enjoy her memories and know she has history of the party to share years later.